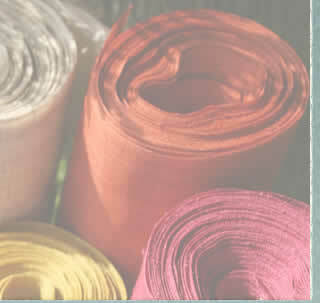 Thanks to its rapid moisture-absorbing qualities, linen is perfect for everyday use items such as dish cloths. 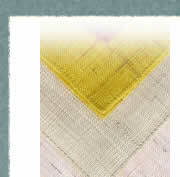 With excellent heat conducting and ventilation properties, linen is entirely suitable for a hot climate. Also, it's easy to clean, stands up well against washing and dries quickly--meaning cleanliness and durability go hand-in hand in this material. Linen is a robust fiber that is also smooth and cool to the touch. Fast-growing linen doesn't need agricultural chemicals, which can be the causes of several kinds of allergies. It's therefore suitable for a wide range of everyday lifestyle items. These days, irrespictive of the time of year, you are bound to see plenty of shops selling items made of linen, as it has now become an indispensible fabric for every day life. 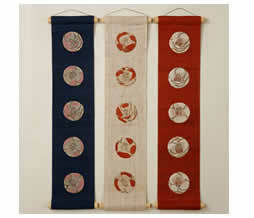 Furthermore, the kinds of linen now available has increased greatly. 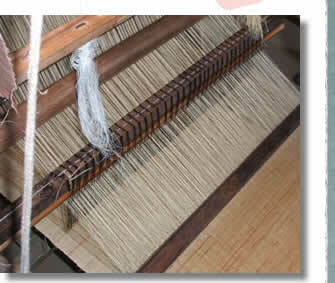 The use of both flax and ramie is central to BAN's range of wonderful linen products. 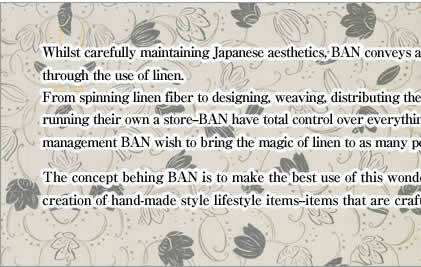 In Japan, when the material of an everyday item is described as being "linen", it can only be flax or ramie; it will not be jute, hemp, etc. 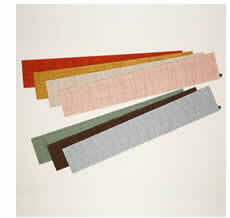 Amongst all of the linen available, these are the best fabrics and the softest to the touch, with excellent properties. 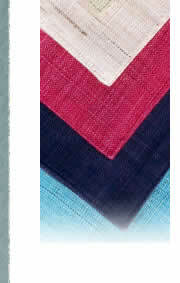 Table runner decorated with soft curving line stitches. Comes in a variety of colors so you can select one for each season. 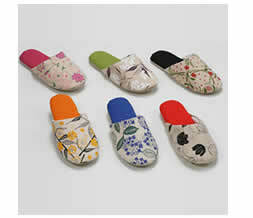 Linen slippers decorated with the flower patterns referred to in the most famous ancient Japanese book of poems. Especially designed to give you a soft, gentle feel. Tapestry with elegant camellias drawn with a brush. A beautiful piece to accent your home. 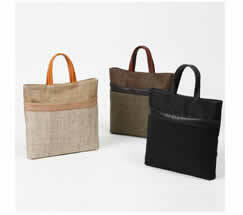 Tote bag made with Inden craftsmanship. Luxurious deerskin surface covered with lacquered print. The handles are cow hide. A bag that ages beautifully with use. 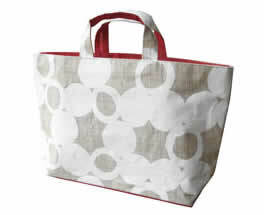 Tote bag with bold and unique dot pattern. Very handy for daily use as well. 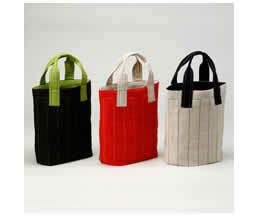 Vivid bag that can also go well with casual wear. Designed with large opening and wide gusset. Just right for those shopping days. When hand-washing, gently knead the item and pinch in appropriate areas. When using a washing machine, wash in luke-warm water (30℃-40℃) for a slightly shorter time than used for cotton items. ●Can be washed using commercially available laundry detergent. Avoid using brightening agents, as they will make the item lose color, hue, etc. Rinse thoroughly in water to make sure all of the washing detergent has been removed. 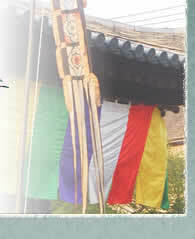 Pull out tightly in all 4 directions, adjust shape as necessary and then hang up to dry. Please avoid using a brush or similar tool on the item as this may cause the material to fluff. Linen is a faster drying material than cotton making it perfect for everyday use. To make the effect of ironing all the more beautiful, we recommend ironing while the item is "semi-dry", in other words before it has completely dried. As linen is a natural material, it does of course wrinkle. However, compared to cotton, the effect of these wrinkles exudes a more refined air with a particular charm, so please feel free to go ahead and try the wrinkled look..